Verizon note 8 will not have annual upgrade, can anyone confirm this? I have the verizon note 8 and one of the NYC store managers that I go through to get my phones just told me that they had a meeting with corporate and that the note 8 will not be eligible for annual upgrade per samsung's wishes. Has anyone else heard differently or can confirm this fact? I had just assumed that it wasn't on the annual upgrade list on the verizon website as it hasn't been officially released but now I'm not so sure. When did the S8 get added to the annual upgrade list? I have read it is not annual upgrade eligible on the Verizon forums. This is the only reason I am holding off on ordering one. It is bad enough that I ordered my S7E a few days past 9/10/17 when that device was taken off the annual upgrade list. A year later and verizon wants me to pay off this phone before trading into another. I know about the 480 credit on the new Note 8 but I will just be stuck in the same place next year. I am hoping they add the Note 8 to the annual upgrade list in the future. Yeah, my wife and I both got screwed by Verizon over that. On our second exchange of our Note 7 for S7E, it was in october so we had to pay quite a lot to pay off both S7E to upgrade to the Note 8. Do people know when the S8 and S8+ were added to the annual upgrade list? This question in the FAQ makes me think it was after the pre-order for the S8. "If I pre-ordered a Galaxy S8 or S8+, do I still qualify for the annual upgrade program? If you pre-ordered the Galaxy S8 or S8+ on a Verizon Wireless device payment agreement, and activate it, you’re eligible for this annual upgrade program." It wasn't until after the release date if I remember correctly. That's why I figured the Note 8 would be a part of it. If it isn't, that's just crazy. It's already expensive AF. Wouldn't want to be stuck with it for 2 years. Can't imagine this is "per Samsung's wishes".. TMobile will let me Jump when 50% paid off, and why wouldn't Samsung want you to upgrade to the Note 9? I think this is more of a "Verizon wants their 900 dollars" thing. Well it looks like it really won't have it. No Note 8 for me. It's true they're not offering it on annual upgrade which is the exact reason my husband and I switched to AT&T. From what I was told, they're not offering it for any phones whatsoever, so it's not just the Note 8. But, they're 100% lying about it being due to Samsung. Several reps gave me that same excuse before we switched but had nothing to say when I said they were the only carrier that's not offering it on annual upgrades. Imo, they're just making excuses because they don't want people to realize how greedy they are. When I pre ordered mine, the salesman told me that as long as my phone was paid 50%, I would be able to upgrade. smooches680 and yast26 like this. I'm brand new to Verizon & I got the Note8 with the BestBuy/Verizon deal. 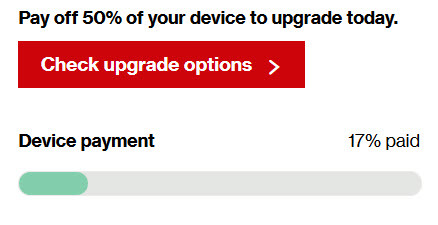 So, does that mean if I wanted to upgrade in a year, I STILL NEED to pay off the full $960. value for the N8?? Awesome! Did you double check your contract to make sure it said upgrade eligible at 50% paid? I ask because unfortunately, some reps will say anything to get the sale. It's supposed to be written somewhere in your device payment agreement. If you can't find it there, call up Verizon. They'll be able to tell you for sure. Yeah, they lied to you. On their FAQ for annual upgrade plans, it specifically mentions that it's not available for the Note 8. I know it matters to alot of people but, doesn't bother me cause by the time I'm ready to upgrade I'll either pay off the note8 or add another line but that's me. When I pre-ordered mine I was told the annual upgrade was for all Samsung and Apple phones with Verizon; it was actually part of the sales pitch to push me to upgrade. This happened to me once, after fighting with them about it, they caved and let me upgrade. Yeah I just don't see the point of paying off a phone that I'll likely never use again when I could just send it back and continue my monthly payments, and I've got no reason to add another line. Honey_184 and Secretagnt like this. After the note 7 recall there were a lot of people without a phone because they traded in their only phone. It's always good to have a good back up phone. I kept my s8+ to have a back up I would be ok with going back to if I needed to. I already have a backup phone, Moto Z, that I got for extremely cheap from Best Buy (120). So, I'm going to be trading in my Galaxy phones every year because there's no real reason for me to have the old one. Also, I'll probably grab a Pixel 2 XL so that I can have a waterproof backup. So having a main phone that's on an annual upgrade plan is advantageous for me. Hopefully the S9 will be eligible for the annual upgrade plan. Why does my Note 8 randomly announce the time?